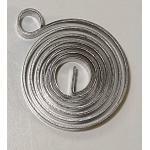 Choke springs can be used to repair obsolete hotair or divorced choke thermostats. Bi-metal choke spring consists of two joined strips of different metals which expand at different rates as they are heated. The different expansions force the coil to rotate one way if heated, and in the opposite direction if cooled. Ford 1101 carburetors Replaces broken or rusted originals. Bi-Metal coil winds up when it is cools. Ford 4100 carburetors Qty: 1 spring Bi-Metal coil winds up when it cooled. Qty: 1 spring Bi-Metal coil winds up when it cooled. 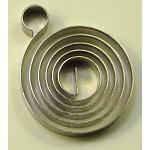 Bi-Metal coil un-winds when it is heated. 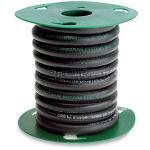 Bi-metal thermostat choke coil spring for Carter carburetors. Replaces broken or rusted originals. 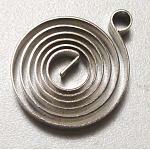 Bi-Metal coil un-winds when it is heated.